BookLink for Social Studies CD-ROM includes data on 15,000 titles with reading levels from grades 4-12+. 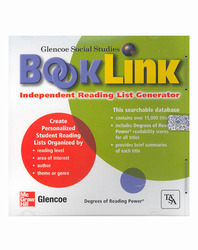 BookLink will easily customize student reading lists by reading level, interest level, and topic. Students become better readers by reading and they will read more when it is appropriate for their needs!